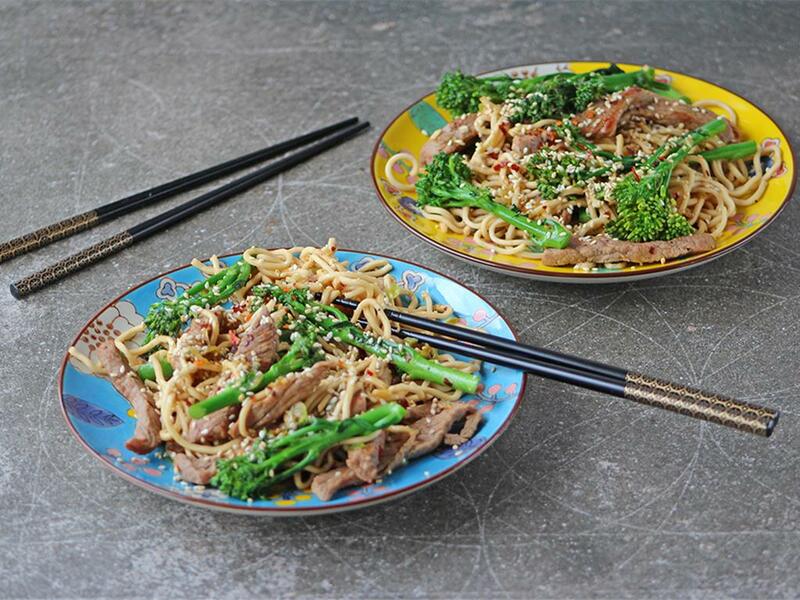 Noodles, tenderstem & beef strips stir-fried in a ginger soy sauce, topped with sesame seeds. Egg noodles: Place the noodles in a bowl, cover with boiling water and soak for 13-15 minutes until cooked, but with a slight bite. Drain. Beef strips: Coat in olive oil, chilli flakes (as much or as little as you like) and season with salt and pepper. Sesame seeds: Place a pan on high heat and dry toast for 2-3 minutes until lightly browned. Toss often to make sure they don’t burn. Ginger soy sauce: Mix together the soy sauce, mirin and fresh ginger. Stir-fried beef: Place a pan on high heat with a drizzle of olive oil. Add the beef strips and sauté for 4-6 minutes until golden brown and cooked, but still slightly pink inside. Remove, reserving the pan juices (if any), and set aside. Ginger stir-fry: Add the tenderstem broccoli to the same pan with a splash of water and cook for 1 minute before adding the spring onions. Sauté for another 1-2 minutes until the tenderstem broccoli is cooked, then add the beef strips back into the pan along with the juices. Add the sauce and the egg noodles and mix through. Serve topped with the toasted sesame seeds.